pt::pe(n) 1.0.1 tcllib "Parser Tools"
This package provides commands to work with the serializations of parsing expressions as managed by the Parser Tools, and specified in section PE serialization format. 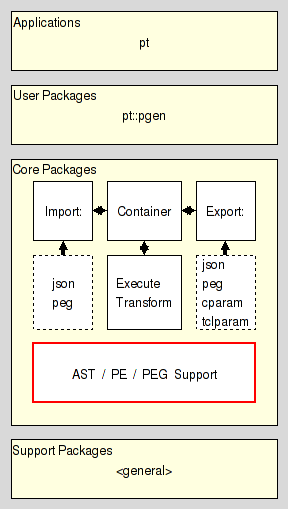 This is a supporting package in the Core Layer of Parser Tools. This command verifies that the content of serial is a valid serialization of a parsing expression and will throw an error if that is not the case. The result of the command is the empty string. For the specification of serializations see the section PE serialization format. This command verifies that the content of serial is a valid canonical serialization of a parsing expression and will throw an error if that is not the case. The result of the command is the empty string. For the specification of canonical serializations see the section PE serialization format. This command assumes that the content of serial is a valid regular serialization of a parsing expression and will throw an error if that is not the case. It will then convert the input into the canonical serialization of this parsing expression and return it as its result. If the input is already canonical it will be returned unchanged. For the specification of regular and canonical serializations see the section PE serialization format. This command assumes that the argument serial contains a valid serialization of a parsing expression and returns a string containing that PE in a human readable form. This command walks the parsing expression pe from the bottom up to the root, invoking the command prefix cmdprefix for each partial expression. This implies that the children of a parsing expression PE are handled before PE. I.e. it is invoked with the parsing expression pe the walk is currently at, the op'erator in the pe, and the operator's arguments. The result returned by the command prefix replaces pe in the parsing expression it was a child of, allowing transformations of the expression tree. This also means that for all inner parsing expressions the contents of arguments are the results of the command prefix invoked for the children of this inner parsing expression. This command walks the parsing expression pe from the root down to the leaves, invoking the command prefix cmdprefix for each partial expression. This implies that the children of a parsing expression PE are handled after PE. The command prefix has the same signature as for bottomup, see above. The result returned by the command prefix is ignored. This command tests the two parsing expressions seriala and serialb for structural equality. The result of the command is a boolean value. It will be set to true if the expressions are identical, and false otherwise. String equality is usable only if we can assume that the two parsing expressions are pure Tcl lists. This command constructs the atomic parsing expression for epsilon. This command constructs the atomic parsing expression for dot. This command constructs the atomic parsing expression for alnum. This command constructs the atomic parsing expression for alpha. This command constructs the atomic parsing expression for ascii. This command constructs the atomic parsing expression for control. This command constructs the atomic parsing expression for digit. This command constructs the atomic parsing expression for graph. This command constructs the atomic parsing expression for lower. This command constructs the atomic parsing expression for print. This command constructs the atomic parsing expression for punct. This command constructs the atomic parsing expression for space. This command constructs the atomic parsing expression for upper. This command constructs the atomic parsing expression for wordchar. This command constructs the atomic parsing expression for xdigit. This command constructs the atomic parsing expression for ddigit. This command constructs the atomic parsing expression for the terminal symbol t.
This command constructs the atomic parsing expression for the range of terminal symbols ta ... tb. This command constructs the atomic parsing expression for the nonterminal symbol nt. This command constructs the parsing expression representing the ordered or prioritized choice between the argument parsing expressions. The first argument has the highest priority. This command constructs the parsing expression representing the sequence of the argument parsing expression. The first argument is the first element of the sequence. This command constructs the parsing expression representing the zero or more repetition of the argument parsing expression pe, also known as the kleene closure. This command constructs the parsing expression representing the one or more repetition of the argument parsing expression pe, also known as the positive kleene closure. This command constructs the parsing expression representing the optionality of the argument parsing expression pe. This command constructs the parsing expression representing the positive lookahead of the argument parsing expression pe. This command constructs the parsing expression representing the negative lookahead of the argument parsing expression pe.